Employee health and wellbeing will become a business value of strategic importance and a significant source of competitive advantage. In this white paper, we explore the global trends placing humans at the centre of the 4th industrial revolution. We propose a framework to explain the relationship between human wellbeing and organisational performance, and provide practical tools to help organisations achieve sustainable high performance. Company performance is built on a foundation of employee health and wellbeing, as well as supportive organisational environment and leadership. 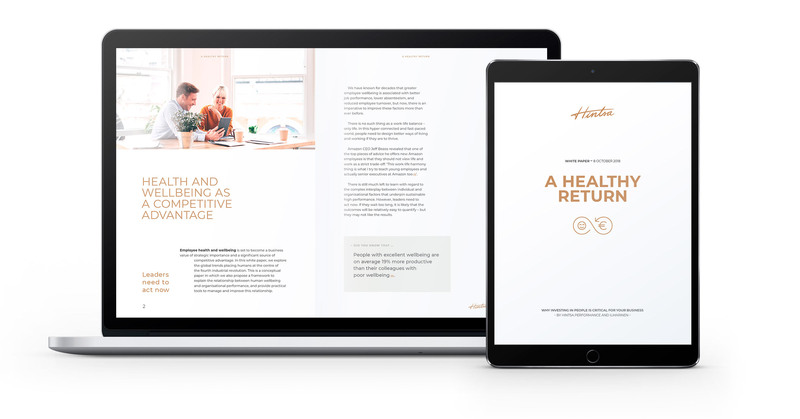 Our latest white paper ‘A Healthy Return: Why Investing in People is Critical for Your Business’ introduces a new framework and practical tools to help your company succeed. Calculate how much your company could save by investing in the health and wellbeing of its employees.